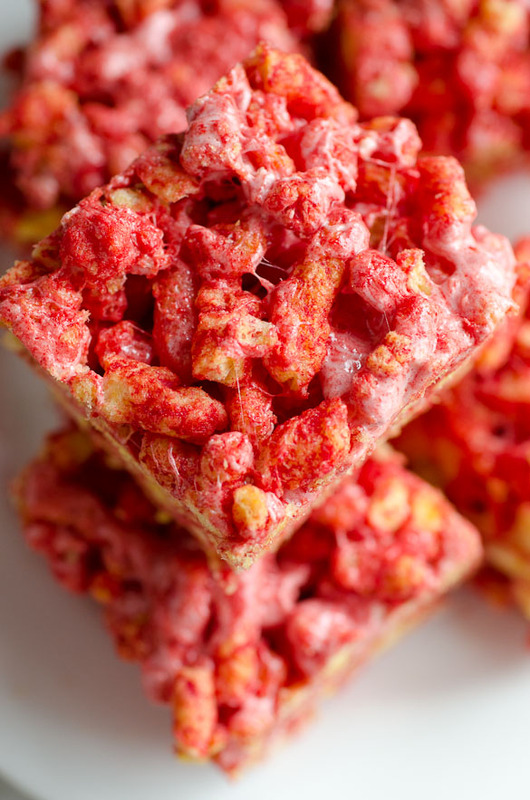 These Cheetos Marshmallow Treats are a cheesy, salty twist to the classic Rice Krispies Treats. 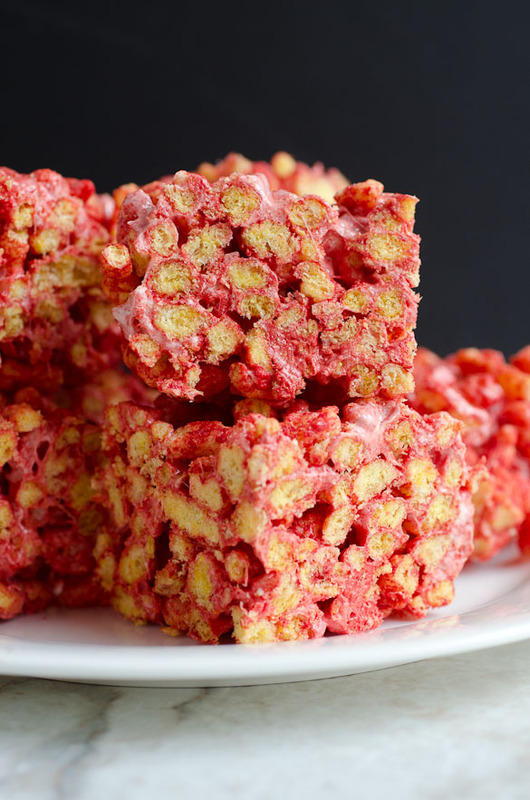 *The photographed treats below are made with the Flamin’ Hot flavor of Cheetos Crunchy snacks, therefore, giving a more red appearance. I may have gone over my boundaries. 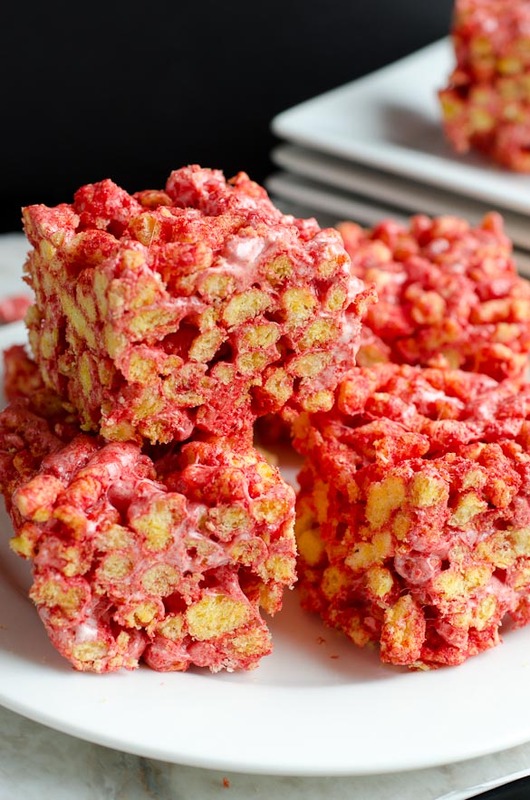 But, if boundaries are meant to keep you safe, then I want to be in danger when it comes to these marshmallow treats. The week before Easter Sunday, Judah came home from preschool with the cutest cone-shaped bag of Cheetos, stuffed at the top with green “grass” to give the appearance of a large carrot. It was the coolest thing! I hadn’t had Cheetos in forever before that day. Judah and I sat at our kitchen table and munched on that bag until they were gone. I’m pretty sure I licked my fingers clean with the last few pieces. I found out that these Cheetos were different than the ones I grew up on. 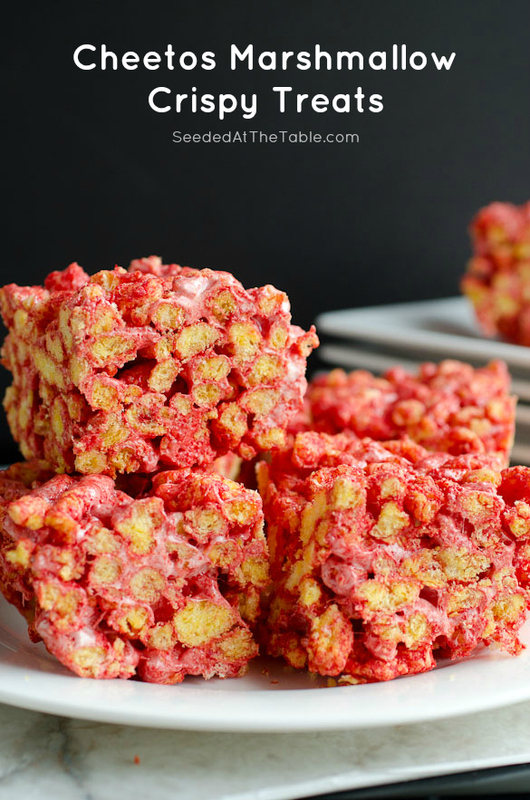 These were oven baked Cheetos and much crunchier! I seriously loved them. 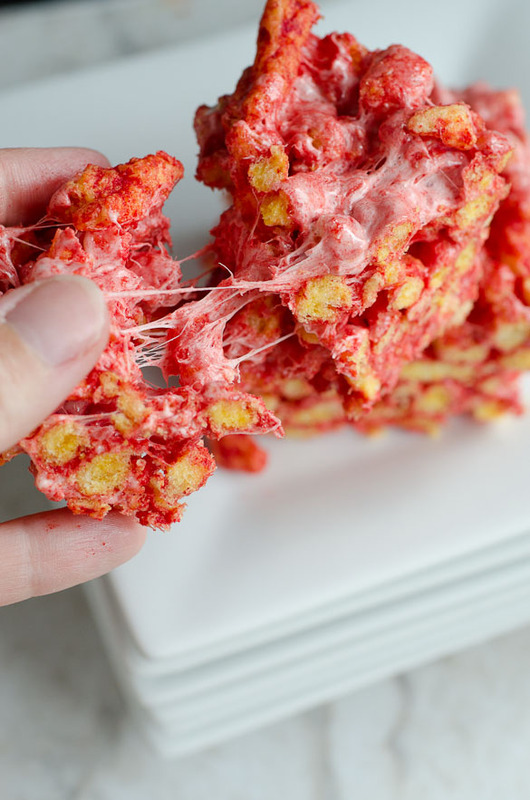 For some reason, my mind immediately went to creating these Cheetos Marshmallow Treats, so I wrote “Cheetos” down on my list for my next grocery store trip. I wasn’t sure how this would turn out. My first mistake was accidentally picking up the wrong flavor. I grabbed two bags of the Flamin’ Hot flavor! Oops! I used them anyway, and didn’t let Judah eat any. Poor kid! They were definitely HOT! But, they were soooooooo good. They’re even better with the original flavor and not the flamin’ hot. 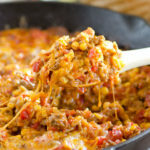 Crispy, cheesy, salty, and gooey. Oh.my.wurrrd. 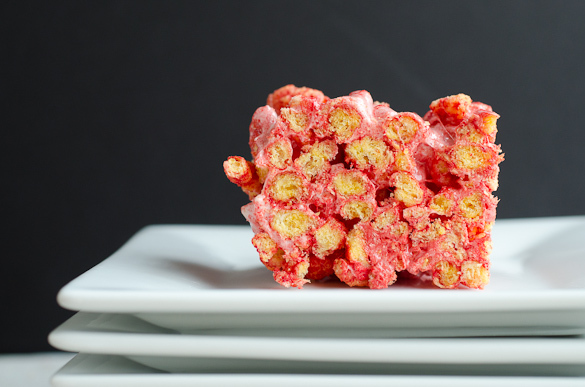 A cheesy and salty twist on the traditional Rice Krispies Treats. Lightly spray a 9-x13-inch baking dish; set aside. Open a bag of Cheetos to let the air out. Scrunch the opening back up to close, then crushed the bags to break up the Cheetos in roughly smaller pieces. Repeat with the second bag then set aside. In a large sauce pan, melt the butter. Once melted, add the marshmallows and continue to heat over medium low heat, stirring constantly until the marshmallows are completely melted and smooth. Immediately, and quickly, stir in the two bags of Cheetos (or just 1 1/2 bags if you want them more gooey). Continue to gently mix until the marshmallows are evenly distributed. 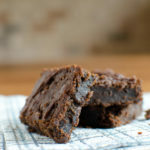 Transfer immediately to the prepare baking dish and press to evenly spread. 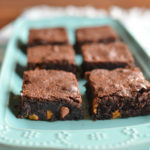 Let cool, then cut into squares. I was eyeing a recipe for caramelized cheetos the other day. I have done cheetos crusted chicken before too and loved it. 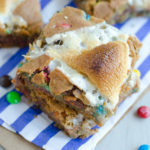 I definitely want to jump off the deep end and mix them up in this sweet treat now! Also, did you add food coloring or did it change to that pinky color? I’m officially intrigued. I’m eating cheetos right now! Now I’ve got some new inspiration for my other bag! So creative!! I would try them. My? Not so sure. Ummm…. These are really amazing!!!! Don’t knock it until you try it people! For me these are ewwww. I don’t like hot Cheetos. But I like regular Cheetos. But not in sweet things like marshmallows. Is there anything better I can use them for? My boyfriend is a huge hot Cheetos fan, he’ll eat several bag a week. So I’m hoping he’ll like these!!! But did you use the baked hot Cheetos or the flaming hot, I wasn’t too sure. If you could answer this it be greatly appreciated!!! My kiddos hubby and myself love cheetos! Regular, flaming hot even the new xtra flaming hot! My daughter had one day surprised me because she was eating the hot cheetos with cream cheese I thought for the longest time that was just gross. Especially because she is a picky girl when it comes to food. So finally after a few weeks she convinced me to try them. Omg they were delicious! So what I’m getting at is that i can totally relate to people being optimistic about these but seriously people think out of the box sometimes. Like I tell my kids try it first then decide I surely learned that lesson. 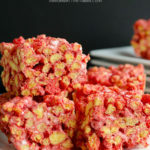 As for these marshmallow treats I’m looking forward to making and trying these . salty/sweet is a good thing!! My son wants a “Toothless” cake for his birthday. So I was going to bake a cake and than make a Toothless Dragon out of rice krispie treats than cover with fondant. 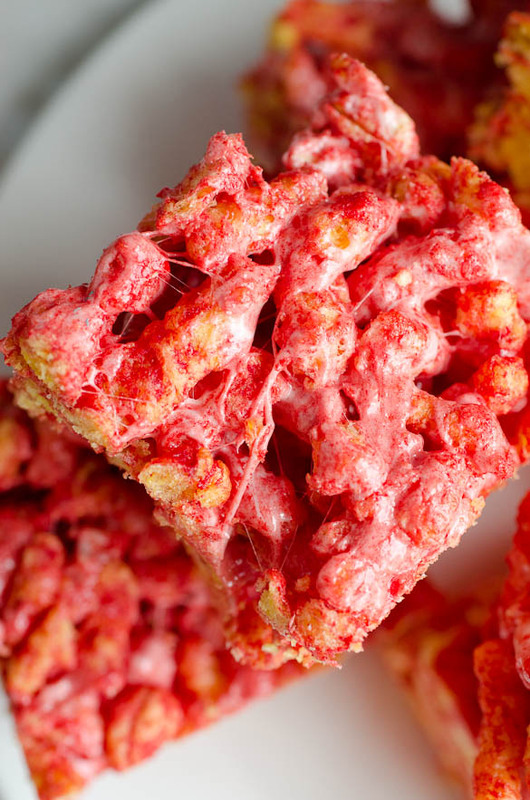 I think that with ALL the bags of Crunchy Cheetos I have I will give these a try instead! Thanks for the idea! 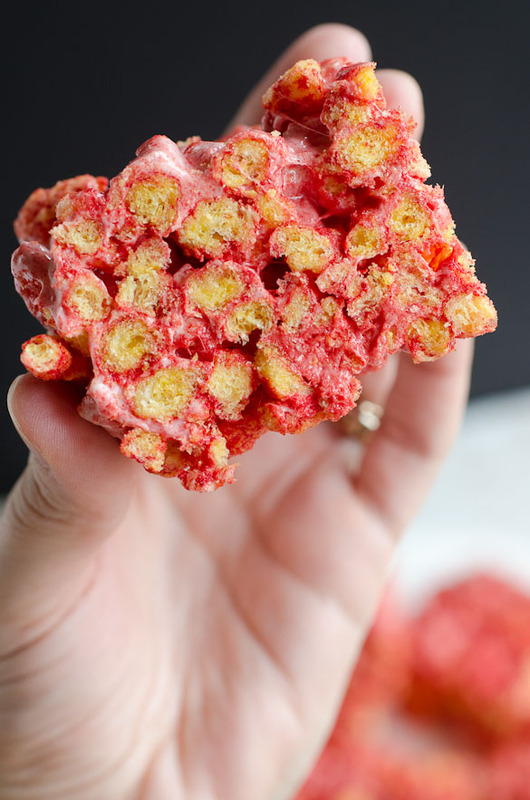 When I make rice crispy treats I put them in the oven once they’re all mixed up. It makes the top caramelized like creme brulee. I can hardly wait to try it with Cheetos recipe. I bet it’s going to add an extra facet of goodness. Thank you so much for the idea to use Cheetos. Pure genius!